Some syllables seem to do more work than they should. For example, if you look up cob and its phonetic variants (cab ~ cub) in English dictionaries, you will find references to all kinds of big and stout things, round masses (lumps), and “head/top.” Animal names also figure prominently in such lists. In English, cob is the name of a male swan, several fishes, a short-legged variety of horses, and a gull. Similar words are sometimes called cop rather than cob. Many of them are regional, but a few are universally known. German Kopf “head” and Engl. cob(web) come to mind at once. Cobble (as in cobblestone) is cob with the same suffix –le that we find in needle, handle, cradle, ladle, and a few others. Though one needs an effort in separating –le from the root, it is a real suffix. Cobbler, a Middle English noun, is, surprisingly, “of unknown origin,” with the verb cobble being “abstracted” from it by back formation (like sculpt from sculptor and televise from television). Then there is Old Icelandic kobbi “seal” and Engl. cub. If we search for similar words in the dictionaries of other Germanic languages, we’ll be swamped by kabbe, keb(be), kibbe, and kippe. Some such formations occurred in Middle English and then died out. No one knows for sure how such words sprang up. They are like mushrooms, rootless and ubiquitous. If they first came into existence as animal names, at least some of them might be pet names (hypocoristic nouns). Perhaps Engl. dog, another noun of undiscovered origin, belongs with such “mushrooms” (see the posts for May 4, 11, and 18, 2016). It is also probable that some words like cob, few of which were recorded early, traveled from language to language, especially between English and Dutch. To enhance our confusion, we may add Engl. cup to this list. The point of this introduction is that Germanic teems with the monosyllables that do not form a family but rather obviously belong together. The story of rob– is not different from that of cub ~ cob: again a welter of similar formations without a clear-cut pedigree. Robert Goodfellow. Image credit: Midsummer Puck Flying by Smatprt. CC BY-SA 3.0 via Wikimedia Commons. In Old French, sheep were often called Robin. The Vikings seem to have brought this name to France from their historical home. Modern Icelandic still has robbi “sheep, ram.” Robbi is also the name of “white partridge.” German Robbe means “seal,” and in Norwegian (Nynorsk), robbe “bugaboo” occurs. This word may throw a sidelight on the rare and obsolete Engl. Roblet “a goblin leading people astray in the dark” and Robin Goodfellow. 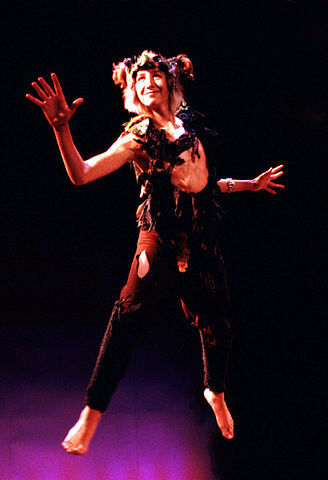 This character, Puck’s double, was especially popular in the sixteenth and seventeenth centuries, just when the word robin gained ground in England. But this goblin can lead astray even sober and dry-as-dust etymologists. He reminds us of Knecht Ruprecht, St. Nicholas’s German companion, and of hobgoblin, because Hob = Rob, and of hobbledehoy. Robert and Robin occupy an important place in folklore. Many must have heard about Robert the Devil and of Meyerbeer’s opera on this plot. French rabouin “devil” may belong here too. 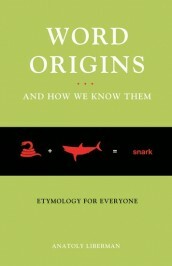 Relatives: etymology and zoology are here at cross-purposes. 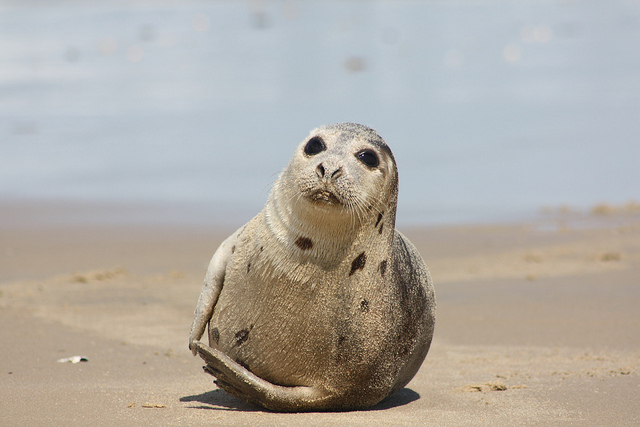 Image credit (top to bottom): Juvenile Harp Seal by Virginia State Parks. CC BY 2.0 via Flickr / Ikes Bunny by Danni505. Public Domain via Wikimedia Commons. 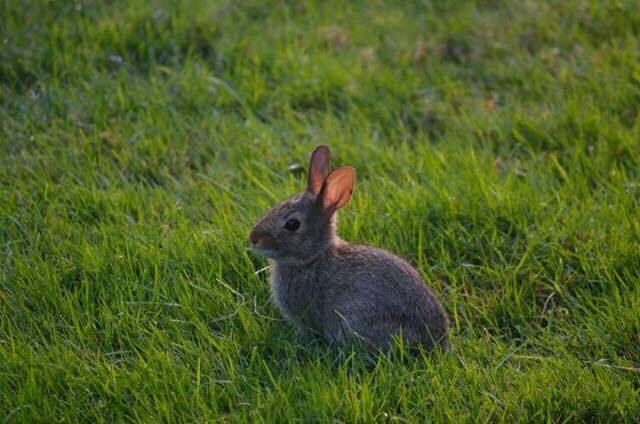 As we can see, rob-, like kob-, is a productive complex, and, while admiring its fertility, we cannot help remembering rabbit, which appeared in English texts in the fourteenth century as a term of French cuisine. Rabbit supplanted con(e)y, just as robin supplanted ruddock. The origin of rabbit has been the object of long and involved speculation. The hypotheses are many. Some people traced rabbit to Robert, others to French and Flemish. But it seems that we are dealing with parallel formations in several Eurasian languages. When people begin to call all kinds of living creatures from seals to spiders kobbi, robbi, tobbi, boppi, dogga, koppe, loppe, noppe, and the like, linguists have to admit the existence of what has been called primitive creation, and coincidences across languages are bound to occur. We don’t know how language arose. We cannot even say at what stage a system of signals deserves to be called language. (Think of such phrases as the language of whales, the language of bees, and the like). Serious etymological dictionaries refer words to ancient roots. Non-specialists will find a long list of such Indo-European roots in the supplement to The American Heritage Dictionary of the English Language. Here are some examples: ster- “stiff,” ster- “to spread,” ster- “star,” ster- “to rob, steal,” and ster– “barren” (they appear in Engl. stare, strew, star, steal, and stirk “a yearling heifer”). Nine homonymous roots appear under kel-, seven under gher-, five under ker-, and so forth. Those are reconstructed roots. The role of such units in the formation of words is far from clear. Students of word origins take it more or less for granted that ster-, gher-, ker-, and the rest circulated in some form several thousand years ago. Perhaps they did, but, if so, there is no need to doubt that kob- ~ kab- ~ kub, rob- ~ rab-, nop-, lop-, and their likes existed in the full light of history. The reconstructed roots are the upper class of the “etymological community,” while the kob– ~ rob- ~ nop- ~ lop- rabble constitutes its “lower orders.” They are its plebeians, riff-raff; rag, tag, and bobtail. But those upstarts were vital and unprincipled. Rabbit superseded coney, and robin superseded ruddock. Were not also the respectable ster-, gher, and ker– such before they attained greatness in our dictionaries? I would venture the hypothesis that robin and perhaps rabbit are similar but much later upstarts, coined perhaps in baby talk, perhaps as jocular forms (in principle, slang). This reconstruction cannot be “proved.” It is doomed to remain an irritating hypothesis. But one thing is obvious. Creativity is not a process that dominated language only in its infancy. It never stops. English speakers are acutely aware of this fact. Slang is born every day, and its origins are usually more than dubious. Every epoch seems to favor one particular type of emotional word formation. Today, people use their ingenuity, to coin multifarious blends. Most are stillborn creatures, but a few will stay. Blog and motel are among them. Webinar may also survive the present generation. Brexit will be forgotten once the painful divorce comes to an end. In the late Middle Ages, the process of word creation was seemingly dominated by the creation of more and more monosyllables. New words spread easily, acquired suffixes (rob-in; rabb-it even added a French suffix), and began to look like old-timers. After all, two and four legs are equally good. Did it all happen the way I think? We’ll never know: just food for thought. Featured image credit: Coney Island by Monica PC. CC BY 2.0 via Flickr. in the moment of founding the life of word, truth only then took a form. Why is this art from the form being placed against the soul of mistreated graces?